Benjapornlad Company Limited was founded in 1989 to operate in property development and management. Its paid-up registered capital is 66,000,000 baht with total asset worth more than 370,000,000 baht. Established as a Subsidiary of JVK Group in 2002 Dynamic IT Solutions is a leader in innovative software solutions with a strong local presence. Our turnkey solutions provide you with a robust network infrastructure using unbreakable Linux servers as a back end. JWD is a Thailand and Indo-China based high-technology integrated logistics solutions provider that enables clients to take full advantage of the benefits that accrue from the outsourcing of logistics activities. 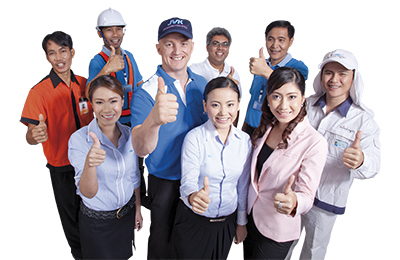 Founded in 2006, JWD Transport (Thailand) Company Limited sets its goal to become the leader in transport and distribution business.